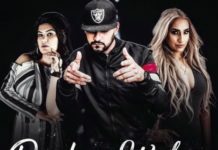 Tere Sheher Chon Lyrics – Raashi Sood Tere Sahar Cho Baaki Ta Saara Kuch Kho Leya Teri Yaad Pendi Kadde Kade Bol Ve Is New Song Sung By Raashi Sood. Song Is Penned By Navi Firozpur Wala. Music Is Composed By Raashi Sood Herself. Song Is Released By Wakhra Swag Music On 30th Nov. 2018. Enjoy The Lyric And Video Song Of Tere Sehar Cho By Raashi Sood. Utthe Kali Kali Peer Phir Ubhari..
Bas Rah Gaiyaan Ne Mere Kol Ve..
Ditaa Soorma Vi Khoon Vich Dol Ve..